As a web developer, I always need to test the application using different browsers like IE6, IE7, IE8, Firefox 2, Firefox 3, Safari and Chrome. 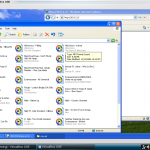 Since I’m using Slackware 13.0 at home, I cannot test using the three different versions of Internet Explorer. Download the SlackBuild package and the source code. Install them in the order they appeared above since the first is a dependency of the second and so forth. Please note that they have different links. Once you have downloaded them, you need to extract the slackbuild package only. 1. Extract the package. I will only show the steps for the first package. The rest will be more or less the same. It will extract to a directory name something like “acpica”. 2. Move the source to the “acpica” directory. 3. Go to the “acpica” diectory. 4. Run slackbuild. You may now change use as root or maybe later when you need to install. 5. It will prompt you where the tgz file is stored after the SlackBuild is complete. Install it using the installpkg command. 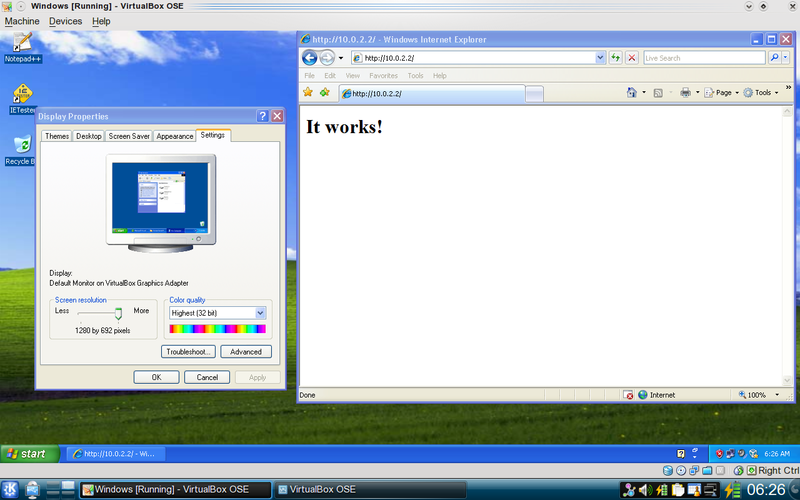 The next steps are to install the virtualbox-kernel package and virtualbox-ose package. The installation for virtualbox-kernel package is just the same as what we’ve done in acpica package. Just a note on the install step for virtualbox-ose. You need to create a group “vboxusers” and make your user a member to that group so that it will be able to run virtualbox. I forgot to mention that the the installation for my virtualbox-kernel package succeed, but the virtualbox-ose package failed! Yes it failed! The reason was that in the last part of the building process (compiling) it failed to copy the PDF file (I think it was named Manual.pdf). Instead of waiting again to go to the office and download the manual, I just created a dummy Manual.pdf inside the current directory. Then proceed with the slackbuilding step. This will load the support kernel module for VirtualBox. A reboot maybe necessary so that kernel modules will be loaded. 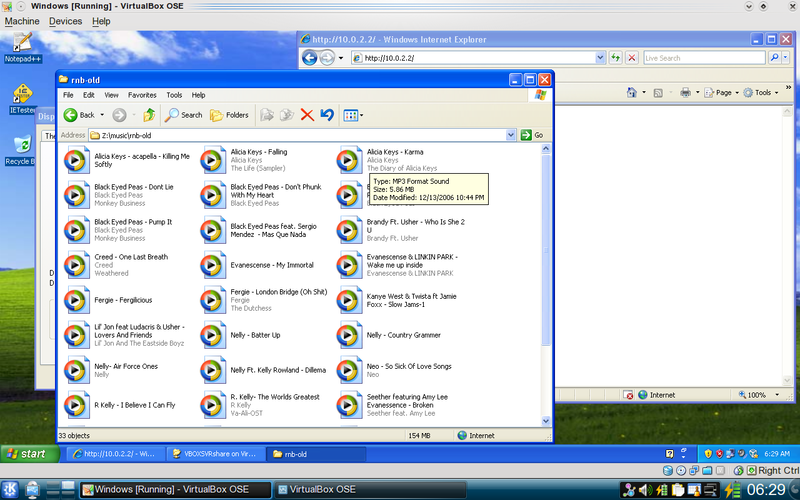 After successfully installing VirtualBox I immediately installed Windows XP SP2 as guest. Then installed Guest Add Ons for more features like mouse integration. I noticed that I cannot establish a network connection from host to client and vice versa. This would be a problem since that is the main purpose why I install VirtualBox. 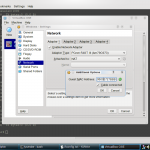 After several trial and error playing with the NAT, Bridged connection, Internal Network and Host Only settings in VirtualBox network settings, I gave up and asked the Slackware Forum. To use VirtualBox NAT you must set “eth0” to some other network address besides 10.0.2.nnn. That is because the NAT is a sort of network gateway/router and connects the two networks (host LAN and virtual machine LAN). The host and the guest SHOULD NOT be on the same IP sub-network. NOTE: “/24” is the same as saying network mask “255.255.255.0”. VirtualBox NAT assigns the virtual machine’s virtual adapters addresses of 10.0.2.yyy for the first adapter, 10.0.3.yyy for the second adapter, and so forth. In order for NAT routing to work, the host OS (Linux) cannot use the same network addresses for any network interfaces. NAT is different than the other virtual networking modes in that respect. 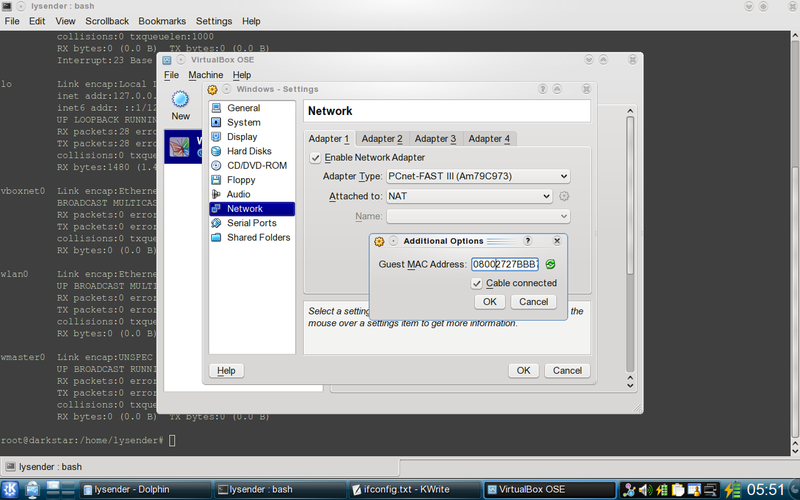 In order for the guest to connect to the host, the guest must use the VirtualBox NAT host address 10.0.nnn.2 (EX: 10.0.3.2), or the address assigned to one of the host’s hardware interfaces such as eth0 (EX: 10.1.4.5). The host cannot connect to the guest unless you forward ports using “vboxmanage”. The host also can’t ping the guest. ALL the virtual machines that have NAT virtual interfaces will share the same set of addresses. In other words the first network interface of all virtual machines will use 10.0.2.yyy if configured for NAT and all of those virtual machines will be able to communicate with each other. The default gateway for a guest OS should be set to the VirtualBox NAT host address 10.0.nnn.2 (EX: 10.0.3.2). That is usually done by the VirtualBox DHCP server. If the default gateway is not defined, then guests can only communicate with the host using the NAT host address 10.0.nnn.2. Now I can browse happily my web application on the Guest. For file sharing, I just created a shared folder in virtual box. Can’t trust the reliability of Windows File Sharing. This entry was posted in Slackware and tagged slackware linux and virtualbox, slackware virtualbox networking, virtual box, virtual box guest, virtual box host, virtual box slackware, virtualbox, virtualbox networking, virtualbox slackware. Bookmark the permalink.